On Saturday, March 1 YDA showed its overwhelming support for Disney hotel workers and UNITE HERE Local 681 at an energetic picket march with over 260 members. Throughout the Anaheim conference Young Democrats made their support known by wearing stickers in support (as seen on the left) and by having conversations with the workers. There was an overwhelming consensus that the labor march was one of the most successful events/actions ever undertaken by the organization. Saturday’s march allowed Young Democrats to show exactly why they are Democrats and what they believe in: fair wages, health care, and justice for working Americans in Anaheim and throughout the United States. YDA President David Hardt, DNC Committeewoman Crystal Strait and DNC Committeeman Francisco Domenech hand-delivered a signed letter from the Young Democrats supporting the workers to hotel management after waiting them out as the hotel executives pretended to be unavailable. The most inspiring aspect of the march was the reaction from the hotel workers themselves. They came up to a number of Young Democrats thanking them for their support, letting them know how important it is that the hotel executives realize that the workers do not stand alone and that people around the country are united in support. Special recognition goes out to the YDA Labor Caucus and CYD Labor Caucus for making this event possible and a success beyond the wildest expectations. YDA will be monitoring the labor dispute between the hotel workers and hotel management in the future, and I will cover the situation on this blog as developments occur. Thank you to all the Young Democrats who came out and marched in support of the Disney hotel workers. Feel free to comment on this post about your experience at the march. 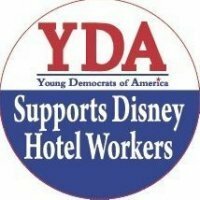 Building off the momentum of YDA’s huge rally in support of the Disney Hotel workers fighting for fair wages, health care and dignity,please help us grow the YDA Labor Caucus. 2) Invite all of your friends to join the YDA Labor Caucus facebook group! Arrive with five! See rally pics and YDA Labor Caucus leader Mike Corbett interviewed prior to rally at our facebook group. Thank you for standing up for workers and building a stronger YDA.